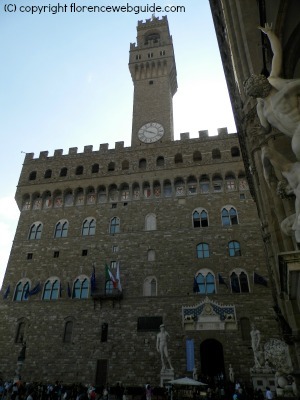 Visiting the Palazzo Vecchio museum means walking through 7 centuries of Florence history. The museum is located in Piazza Signoria in Palazzo Vecchio, the city's most historic building which goes back to 1299 and one of Florence’s – indeed, Italy’s - most recognizable and admired palaces. This city landmark allows you to get close to Florence’s past and walk through the rooms where many significant events took place. Books could be written about just this one room alone. Huge and monumental, there is more history in this one space than many museums have in their entirety. Literally translated as ‘the Chamber of 500’, many people mistakenly believe that ‘500’ refers to the year when the room was built. But ‘500’ is not a reference to the year, but rather to the number of people the room was meant to hold. The room is the largest in all Italy, measuring 54 by 23 meters (175 by 75 feet) and was meant to fit up to 500 council members who would be able to attend meetings as representatives of the city. An interesting note: although this is one of the most famous parts of Palazzo Vecchio and the most visited area of the museum, this room is not kept 'off-limits' for mere admiring, but is frequently used for everyday functions in the life of Florence such as for concerts and cultural or political events. The Salone was not part of the original structure of the building but was added in about 1495 by request of Savonarola, the Dominican friar who had come to power in Florence at the time (in 1494 the Medici had been banished from the city). Savonarola wanted to bring a more democratic government to the people and conceived of this chamber as a place where the people could be better represented. The room with frescoed walls and painted ceiling panels that you see today has nothing of the sober simplicity that Savonarola believed in however. 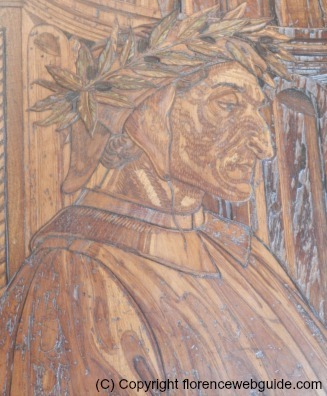 In Savonarola’s time the room was austere and spartan. The current look for the Salone was created under Cosimo I de Medici who transformed this enormous space during the second half of the 16th century (by that time the Medici were back in power in Florence and Savonarola had been executed). 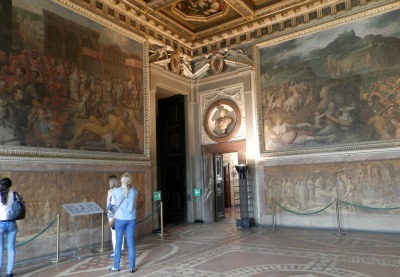 The room was turned into a space for the glorification of Cosimo I and the city of Florence. The ceiling was raised to give a greater sense of grandeur, and was then covered in painted panels and the walls were frescoed. 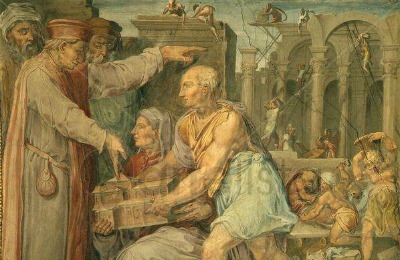 This work was done by Giorgio Vasari (1511 – 1574) and his assistants. After Savonarola's time yet before Cosimo I arrived in Palazzo Vecchio, the Salone dei Cinquecento was the stage for a fascinating bit of history between the Renaissance greats, Michelangelo and Leonardo da Vinci. In 1505, both Michelangelo and Leonardo da Vinci were hired to work on two wall murals, each artist working separately on a different side of the room. 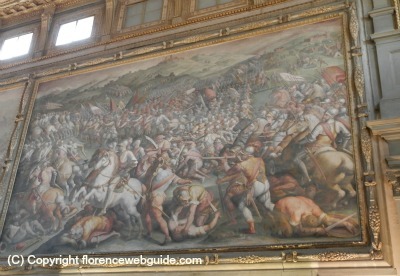 The masters were commissioned to paint frescoes depicting two different battle scenes in the history of Florence. Michelangelo and da Vinci were rivals, and having the two work on opposide sides of this great chamber, with each artisit undoubtedly trying to out-do the other, must have certainly sparked the competitive fires in both! Leonardo's subject was the 'Battle of Anghiari', won by Florence over the Milan army in 1440, whereas Michelangelo was to paint the 'Battle of Cascina' a Florentine victory over Pisa in 1365. An eternal experimenter, Leonardo decided to use oil-based paints instead of the water-based colors usually used for frescoes. He soon found out however that these paints did not dry, and the colors ended up trickling into each other. Frustrated, Leonardo abandoned the project (da Vinci was a notorious non-finisher of commissions). Below is a replica of what Leonardo's work is thought to look like. 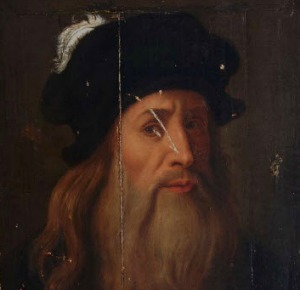 Certainly you have heard about the search for the ‘lost Leonardo’? Well, 'the Battle of Anghiari' is that lost painting and is thought to be in this room, behind one of the present-day frescoes. 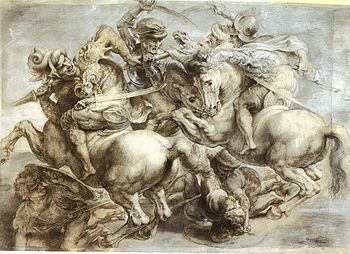 Below is a picture of ‘the Battaglia di Scannagallo’ painted by Vasari in 1567, the fresco thought to be covering the lost Leonardo work. Researchers believe that this painting has a ‘clue’ inserted by Vasari that beneath his work is the work of the great Leonardo (who Vasari revered). 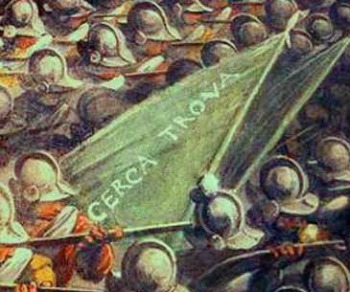 In the center of the battle scene a soldier carries a flag with the words ‘cerca trova’, ‘seek and you shall find’, believed to mean that there is something to be found underneath. The story of Michelangelo’s fresco is not so wrought with difficulties. Michelangelo was much more disciplined than Leonardo. He diligently and successfully completed the sketch of the work which was ready to be transferred to the wall. Unfortunately though, he was then called on by the Pope in Rome and was forced to abandon the fresco and leave Florence. 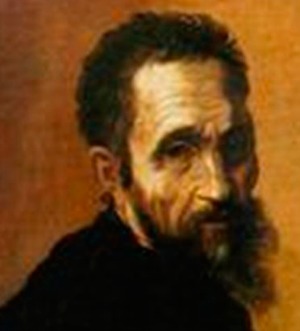 Copies of this Michelangelo sketch survive today so we know what the painting looked like, although these copies are not originals but copies of the original done by Michelangelo’s assistants. 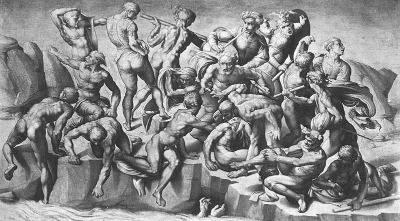 The original sketch was destroyed by Bartolommeo Bandinelli – a rival of Michelangelo’s at the time - in a fit of jealousy. The paintings and frescoes that you see all represent Florence history and Cosimo I’s exploits in expanding the territory of Tuscany. Cosimo was not content to be merely Duke of Florence but wanted to take over Siena and become Grand Duke of the whole of Tuscany (which he eventually did). in this ceiling panel Cosimo is seen seated while planning the war on Siena. To the right of Cosimo's right hand you can see a small model of the city of Siena. 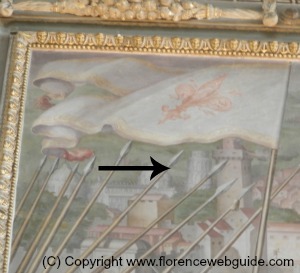 Below is a small section of a much larger fresco on the left wall of the Salone dei 500 depicting the battle against Pisa. The black arrow points out the city's famous tower in the background which - even in the 1500's - was already leaning! In the central ceiling panel Cosimo gets his wish and is crowned 'king' of Tuscany. 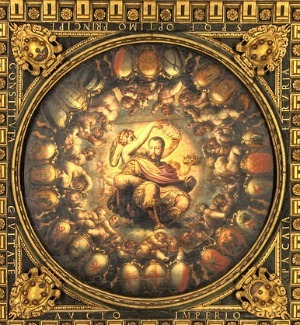 In this image his achievements and Cosimo are seen in a God-like celestial vision. 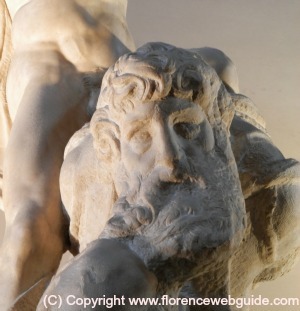 The Salone is also home to the Michelangelo sculpture 'Victory' which is located along the right wall. Dated circa 1533, the work was originally meant for the tomb of Pope Julius II and represents victory squashing vice. In the corner of the Salone dei Cinquecento is the entrance to a small yet highly exotic room, the Studiolo of Francesco I de Medici, Cosimo I's son. This space is a windowless room full of secret compartments, with the door of each compartment covered by a painting. Francesco - a science buff - used this room as his secret study where he kept the many rare and valuable objects that he collected. 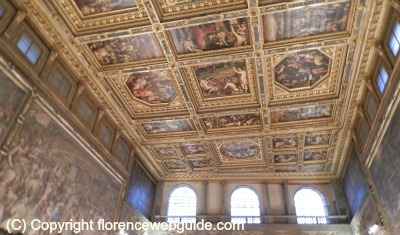 The artwork was done by Vasari and his assistants and is a rich example of Florentine mannerist painting. 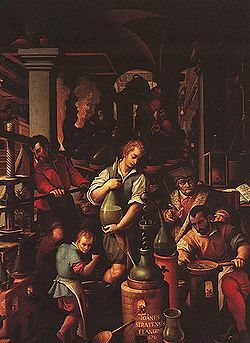 Francesco's room was a tribute to alchemy, and as such he refused to allow any religious images whatsoever to be painted. Although he was a nobel, he also had himself painted into one of the works depicted as a mere laborer melting metal in a workshop (the dark bearded man in the lower right corner in the pic on left). Visits to the studiolo are only during certain hours and may require pre-booking. The Monumental Apartments are the part of the Palazzo Vecchio museum where you can visit the rooms set up by Cosimo I to pay homage to the past members of the Medici family, his predecessors in Florence. 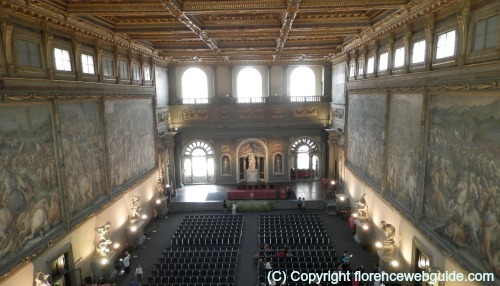 These are also the rooms that Cosimo I used as the family's ducal residence. 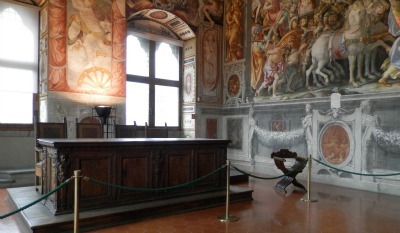 There rooms on the first floor are dedicated to the most influential Medici members prior to Cosimo I. In addition to paying homage to his family, these rooms were built also in remembrance to the historic importance of these members of the Medici family and their impact on Florence history. These rooms are all frescoed with images showing military successes, alliances forged, diplomatic meetings, births, weddings, and christenings of family members, and similar events. Below is a ceiling fresco which shows Cosimo the Elder on the left and Brunelleschi showing him his proposed model for the new design of San Lorenzo church. Below, a realistic detail in one of the frescoes in the room of Leo x. A girl in the street stares at the artist as a doggie goes about its business. The second floor of these apartments contains the 'Quarters of the Elements', which are made up of Cosimo’s living area. The frescoes are inspired by the four elements of earth, water, air and fire, each painted as an allegory meant to glorify the Medici and Cosimo I in particular. 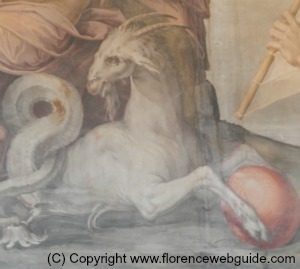 The goat in this fresco is holding a red ball, a clear symbol of the Medici family (whose coat-of-arms is famously covered in red balls). But which member of the clan? Cosimo, although born under the sign of Gemini, sees himself as a capricorn. Cosimo became Duke in January 1537, a date which he considered his 'second birth' under the sign of the goat. Capricorn was also the sign of great military leaders such as Augustus, the first emperor of Rome. 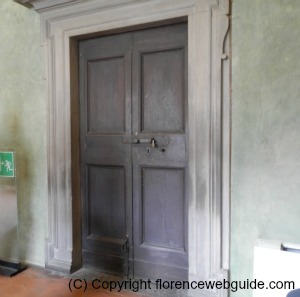 The second floor is also where you can see the apartments of Eleonora di Toledo, Cosimo I's wife. The rooms re-designed for Eleonora are some of the oldest rooms in Palazzo Vecchio and werre part of the original construction of the building. One of the most popular rooms is Eleonora’s chapel, richly painted by Bronzino, official painter of the Medici. The recurring theme in the rooms here is female virtue. In fact, each room is dedicated to a different woman in history who is praised for one specific quality. 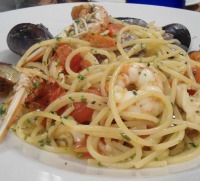 The reference to these famous women was an allusion to Eleonora herself possessing the same virtues. 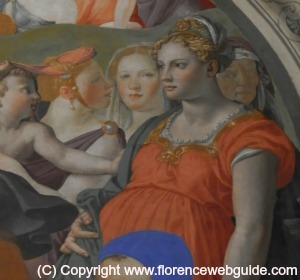 Below, a pregnant Eleonora di Toledo in one of the frescoes in the chapel painted by Bronzino. 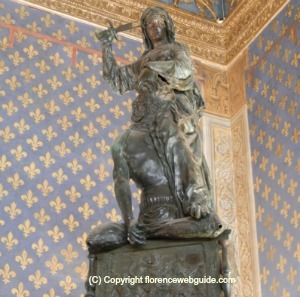 Below, Gualdrada, a famous nobile Florentine woman known for her loyalty. 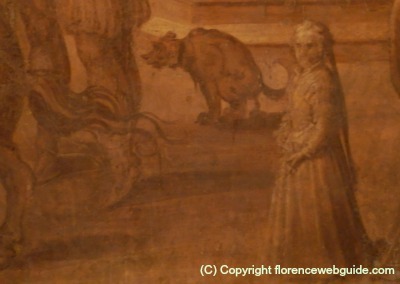 Notice the Florentine symbolism, Gualdrada holds the red giglio of Florence and is leaning on a small lion, another emblem of Firenze, the lion Marzocco. These doors are found in the 'green room'. No, this is the entrance to the Vasari Corridor, the secret passageway that leads from Palazzo Vecchio to Pitti Palace. The passageway was built so that the ducal family could go from one building to the next undisturbed and in total safety. 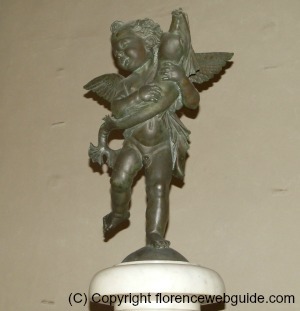 The second floor of the Palazzo Vecchio museum is also home to Verrocchio's famous 'Putto con Delfino'. Although literally translated as 'cherub with a dolphin' it is more likely that the boy is holding (squeezing actually!) a fish considering the size. This 15th century sculpture was originally made by Verrocchio for a fountain at the Medici villa in Careggi (just outside of Florence). Supposedly it was Lorenzo himself who commissioned the sculpture with water that squirted out of the fish's mouth. 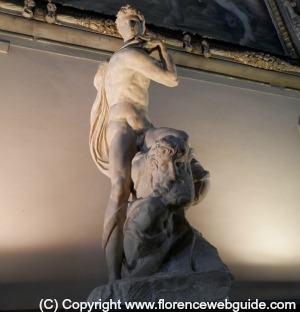 A very fine copy of the statue also stands in the first courtyard of Palazzo Vecchio. 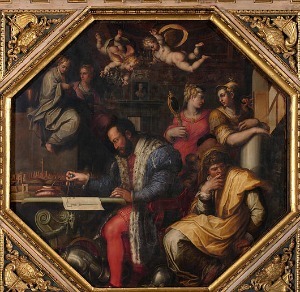 The second floor of the Palazzo Vecchio museum is also home to this mysterious painting. What looks like a simple Madonna with Child, upon closer inspection includes what certainly looks like an unidentified flying object. On the right of the Madonna, a black object is in the sky. No satisfactory explanation for what this black object is meant to be has been found, which has led to the (unofficial) naming of this painting as the 'Madonna with UFO'. 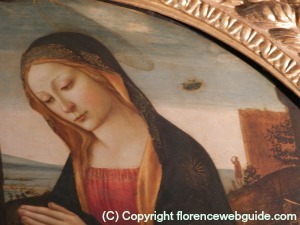 Also the man with his dog to the right of the Virgin Mary's shoulder are pointing to the object in the sky - a mystery indeed, and worth closer inspection during your visit to the Palazzo Vecchio museum. This part of the Palazzo Vecchio musuem has the offices used by the Florentine Republic, the oldest rooms in the building. 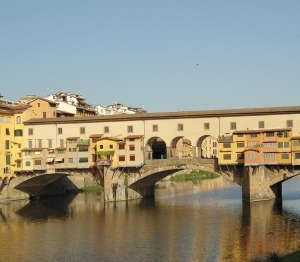 In the 13th century the people who governed Florence were called ‘Priori’. In order to become a 'priore' you had to be a member of a merchant guild, the corporations of the local businesses. Priori were chosen at random and served very short terms of only two months. There were 8 priori and one gonfaloniere – the man in charge of justice and trials. The ancient rooms you can see here are where the most important business was conducted by the priori and gonfaloniere. Below see Donatello's sculpture (circa 1460) in which Judith is saving her city by cutting off the head of the invading army general. Florence found allies and protectors in the some regions of France and the use of their symbol was a way of showing appreciation. Two wooden doors in this part of the Palazzo Vecchio museum have etched portraits of Dante and Petrarch that are truly magnificent to behold. These wooden sketches were done according to a design by Botticelli. 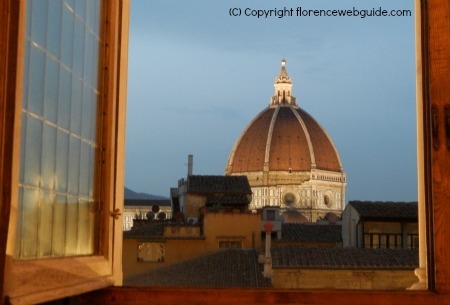 A night view of the Florence cathedral, Santa Maria del Fiore and its magnificent Dome. This shot was taken from the window of the Hall of Justice. 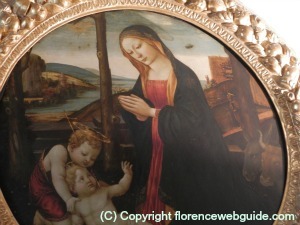 The Palazzo Vecchio museum is different to many of Florence's other museums in that it is the building and its history that are on display rather than works of art placed into rooms. For anybody who is more interested in history than individual pieces of art, this is the best museum in Florence for you. 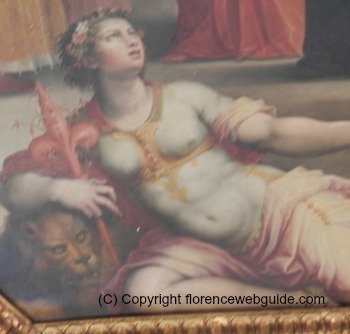 Which is not to say that art lovers won't appreciate the Palazzo Vecchio museum. Sculptures by Michelangelo, Donatello, Verrocchio, Giambologna, and Bandinelli as well as painting by Bronzino, Vasari, Allori and others further make this museum certainly worth visiting. The one thing I highly recommend however is that you get as much information about the museum as possible so that you can better appreciate your visit. The Info Point of the museum has a very good audio guide (5€) or downloadable app (€2) as well as offering very good guided tours with just a small surcharge (2€) on a regular ticket. Getting an explanation of everything you will be seeing will turn a very interesting museum experience into an unforgettable walk into the Florentine past. This museum has no pre-booking for unaccompanied visits so either book a guided tour (see link below to official site) or g0 at 'off' hours. 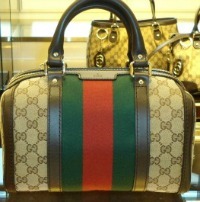 Lines are not extremely long but they can be very slow. You can also book by going to the Info Point at the ticket counter. For first time visitors, I recommend purchasing a combination ticket 'museum + tower (Torre Arnolfo)' and paying the small sur-charge to have an official guide accompany you on the museum visit. The museum also offers several specialized tours (such as 'secret passages' which takes you into rarely visited hidden rooms of the palazzo) and entertaining children-oriented tours. Unfortunately there is no set schedule or regular program so either use the contact details above or go directly to the Info Point in person to find out what's on during your visit. Find Out More about Florence!